One could only dream of such a magnificent property. 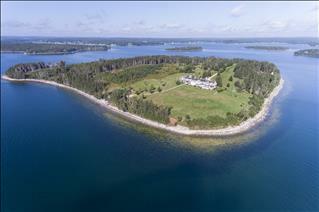 Kaulbach Island – named after past owners of the island is peaceful, private and sheltered. The Island is part of the drumlin formations along the south coast of Nova Scotia. Kaulbach was etched by glaciers, millions of years ago, leaving behind a fifty seven acre island, now transformed into softwood forests and meadows. To walk the perimeter of the island you will cover over a mile of shoreline. 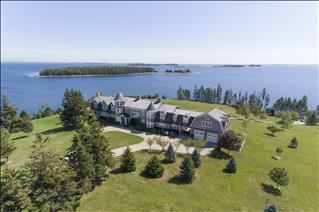 The island hosts a magnificent Cape Cod style home with a gambrel roof, creating 11,040 square feet of luxurious space. Other major features are a double garage with chef quarters, a beach cottage, farmhouse, utility outbuildings and a solid pile driven wharf with deep anchorage, everything you need is here, including a motorboat and a sailboat. 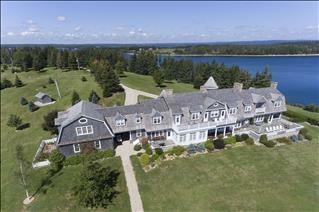 One of the finest homes in the province, the craftsmanship and finishes are superb. The pride of both workmanship and stewardship are evident at every glance. From the rich golden pine living room, the warmth of the quarter sawn dark oak library, the bright morning room, the exquisite gourmet kitchen and pantry to the expansive slate terraces, the screened covered porch with beach stone fireplace and the peaceful sunset room, every detail has been thoughtfully considered. Osprey Nest is offered fully furnished. With exquisite window coverings and furnishings hand chosen for each room, the rich colors and furniture are only surpassed by the captivating views of the ocean. Where is it? Kaulbach Island is short boat ride from the mainland. Located between the scenic sea side village of Chester, with a Playhouse, yacht club and oceanside golf course, and the town of Mahone Bay, with creative festivals and interesting artisans and shops, offering world class sailing. 90 minutes to Halifax airport. ISLAND PARCEL: 57 acres and 1 + miles of shoreline INFRASTRUCTURE: Undersea power cable from mainland. All island services are buried. Emergency generator, Highspeed Internet, Telephone, landline, Satellite, TV. 3 BUILDINGS ON PROPERTY Main House 11,040 sq.ft. 7 fireplaces 11 bedrooms, 9 baths 1 bedroom apartment with 2 car garage. Guest. Farm House is 1200 square feet, 1 fireplace and 3 bedrooms Beach House is 600 square feet with 1 fireplace, a bar with a waterside deck Graveled & natural roads & paths Flowing meadows ~ allowing easy installation of tennis courts or pool. Boat shed with marine rail and other storage buildings. Pile driven wharf and related wharf floats CHATTELS: All furnishings and appliances included John Deer gator, golf cart, Boston Whaler, Sailboat.